(Justice#31 (fb) - BTS) - Judge Mental organized the Forsaken. (Justice#20) - Seraph battled Justice while protecting James. 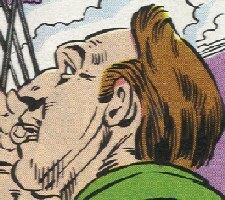 (Justice#25-27)- Judge Mental hired Quill and sent him to assassinate Justice, but he was instead killed by Angie Tensen. (Justice#30) - Agents of the National Security Council--Chauncy, Playback, and Shudderbug--investigated reports of renegade paranormals hiding out in Coney Island. Playback was stealthily captured by Figurine, and the other two only realized it when she had vanished. 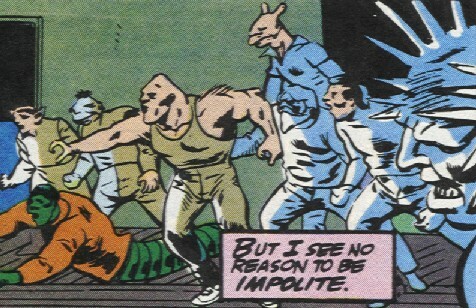 (Justice#31) - Shudderbug and Chauncy were captured by Horny Toad and Seraph, respectively. While they were held prisoner, Augur reported the failure and death of Quill, and noted that Justice would come, but could not ascertain what the end result of that conflict would be. Captain Brooklyn invaded the Terminus to free them, punching out Horny Toad in the process. The three prisoners were then brought before Judge Mental. (Justice#32) - Impact--under the direction of Judge Mental--blew up the National Security Council headquarters, injuring its leader Terrence Updike. Captain Brooklyn confronted the Forsaken, but was slain by Seraph. Justice and Angie Tensen then invaded the Terminus, killing Judge Mental and Seraph. Justice then replaced Judge Mental as the leader of the Forsaken, and Angie and Shudderbug decided to stay with him. Kleenex then traveled out to the Terminus to be with Angie. COMMENTS: Created by Peter David and Lee Weeks. Many of the characters and the Terminus beneath Coney Island were used in a book published in May 1992.The book was titled "Haven" and was part of a series called Psi-Man, written by Peter David (using the pseudonym David Peters for that particular book). 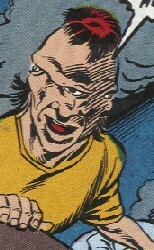 The series involved a telepathic/telekinetic fugitive on the run from the government. Pretty standard faire. In "Haven", Figurine, Horney Toad, Augur, and a version of Justice himself all figured quite prominently. I wonder if Peter David had the characters already and used them in two different projects or whether he thought the ones he used in "Justice" were good enough to recycle? Just an interesting bit of trivia. She serves as the prophet to the Forsaken, and her sacrificing of a goat distracted Shudderbug so that Horny Toad could ensnare him. Named for the ancient practice of augur, she sacrifices animals and attempts to divine the future by reading their entrails. Like most precognitives, she often glimpses multiple potential futures, which become clearer as the moment of the event actually approaches, as well as with the more information she obtains. Unknown factors tend to increase the uncertainty of her predictions. 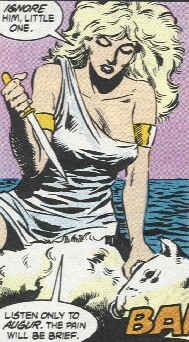 Her powers also allow clairvoyance and post-cognition. He assisted Seraph's defeat of Captain Brooklyn, supply the grenade which killed him. He confronted Justice when he approached the Terminus, but was easily subdued. He likely has enhanced strength, speed, agility, and possibly senses. He also dresses in military garb and carries grenades, handguns, etc. She was the one who snatched Playback, but other than that, she just pretty much walked around naked. Horny Toad once ensnared her with his tongue and she punched him out. She was nauseated when Seraph slew Captain Brooklyn. She is virtually transparent, but her exact powers are uncertain. She speaks with a Southern drawl. He was a former native of Los Angeles and was always complaining about how much better that was than everywhere else. His powers proved useless against Captain Brooklyn, and Justice trapped him under the defeated Dog O'War. He could project bursts of flame. He served as a lookout for the Terminus, and it was he who first noticed Justice's approach. He has four eyes, each spaced 90 degrees around his head. He may or may not have enhanced vision, beyond the obviously 360 visual field. He captured Shudderbug by snagging him from off of the boardwalk with his tongue and dragging him into the Terminus. He lusted after Figurine and tried to entice her with his tongue, but she was not interested. 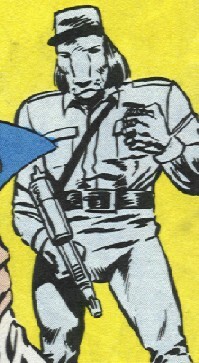 He was easily subdued by Captain Brooklyn, and later went after Angie Tensen when she and Justice invaded the Terminus. He easily shrugged off a punch by Angie, but when he tried to snag her with his tongue, she dodged and it got stuck on the Merry-Go-Round, which dragged him behind. Angie tried not to laugh too hard. 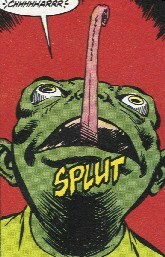 He had a toad-like appearance and apparently had some degree of enhanced durability, but his greatest power was his extendable prehensile tongue, which could snare, bind, and drag others. 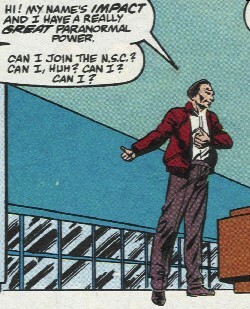 Made somewhat unstable by his powers, Judge Mental sent him to Washington, DC, to apply for membership as one of the paranormals members of the NSC. Impact happily did so, blowing up the entire NSC headquarters and crippling Updike in the process. His body released a massive explosive charge with any hard impact, even just falling over backwards. He was picked on by others for his appearance, until Seraph showed up and laid the smack down on them. He came on to Angie Tensen at the Pitt Aid concert, but he became violent when she rebuffed him. Justice confronted him, but he escaped with the timely intervention of Seraph. He later joined the Forsaken, and went after Angie again after she and Justice invaded the Terminus. She surprised him and took him out with a large set of cymbals she found in the park. 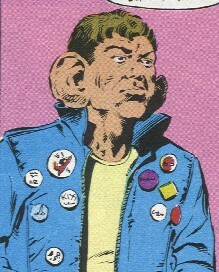 He had enhanced hearing, as well as greatly enlarged ears. Quote: "Hey, you know what a guys ear size is proportional to? His hat size. Fooled ya."